First things first—Spoilers! Anyone who's a big fan of Anime will know that there are just some scenes that are, for one reason or another, absolutely heart wrenching. I'm sure many people are going to take issue with me leaving off a few of their favorites, but generally I'm going to try and keep it to one moment per anime. So with that in mind, honorable mentions are Maes Hughes' death, Lelouch's death, and anything from Angel Beats. I thought I'd start off with an easy one, and now that I'm adult, it's a lot easier to watch, however at the time... damn. But hats off to 4Kids! for getting something right for once. But hey, even a blind squirrel will find a nut on an occasion. The first Pokemon we see Ash ever catch is Butterfree, and for a while we go on a journey where we grow attached to the little guy. I could just cheat and mention several parts of Angel Beats. However, I'll just pick the saddest of the bunch. Angel Beats is a story about a group of students in a high school purgatory, who are trapped their due to having their childhoods cut short. There are numerous depressing and tear jerking moments through out, however the saddest comes at the end once everyone but Yuzuru and Kanade have passed on. Yuzuru, who has fallen in love with Kanade, suggests they stay and help any others that might wander in this world so that they don't fight against it like so many others had. It's at that moment that Kanade reveals that her existence in this world was thanks to him. Her own life had been cut short due to an accident and her life was extended due to Yuzuru marking himself down as an organ donor before passing. Now with his heart beating inside her chest, the one thing she regretted was not being able to thank him, hence why she wandered in to this world. The end result would be a sobbing Yuzuru allowing Kanade to pass on, begging her not vanish, with her thanking him. Luckily many of feels would be calmed in a five second clip after the ending, which revealed the two meeting in the next life. Code Geass had it's fair share of depressing moments, and outside of perhaps the ending, I don't think you can find a sadder moment than this. Some people like to debate that Rolo's death was sadder, the only issue I take with that is that by that point most people hated Rolo. In addition, Lelouch faked kindness in his dying moments. When it comes to Shirley, it was a love story gone horribly wrong. Lelouch hid under the identity of Zero as he led a terrorist group called the Black Knights against the Holy Britannia Army. Using his power of the Geass, he could make anyone obey him once. The chaos and drama that followed can only be explained by watching it for yourself. Shirley got mixed up in the heat of all, and no matter the circumstance she always loved Lelouch, even after having her memories wiped and father killed by him, she fell in love all over again. Lelouch also had his memories altered in believing he had a younger brother named Rolo. Even when gaining those memories back he kept him by his side as pawn. However Rolo developed genuine feelings towards Lelouch and grew jealous of Shirley, killing her and leaving her to bleed out. Lelouch would stumble across Shirley's bloody body, as they had one last exchange of words, attempted to use his Geass to command her to stay alive. But not even that could stop the inevitable, the scene ends with Lelouch giving a scream of absolute sorrow as Shirley goes limp and dies. Nina's death once made a previous list of mine, however it's not her death that is the saddest thing in all this, so it deserves a second look at. Shou Tucker had taken in the Elric brothers so that Edward could study for his exam. At they time they met Shou's incredibly adorable daughter, Nina. Shou would leave you to believe that his wife had left him, and he was raising Nina alone. He was well regarded as an amazing alchemist for creating a talking Chimera, but now needed to do they same again to continue funding his research and way of life. When he goes to show his research to the brothers, the chimera strikes a resemblance to family dog, except with brown hair similar to Nina's. In addition, it utters "big brother Ed." At that moment the wheels began to turn and Ed came to the conclusion of what has taken place. Shou Tucker had transmuted his wife two years ago and now did the same to his daughter. All Shou cared about was staying a state alchemist, whilst the Nina chimera showed nothing but the innocence of a child still, and it suffered in pain. 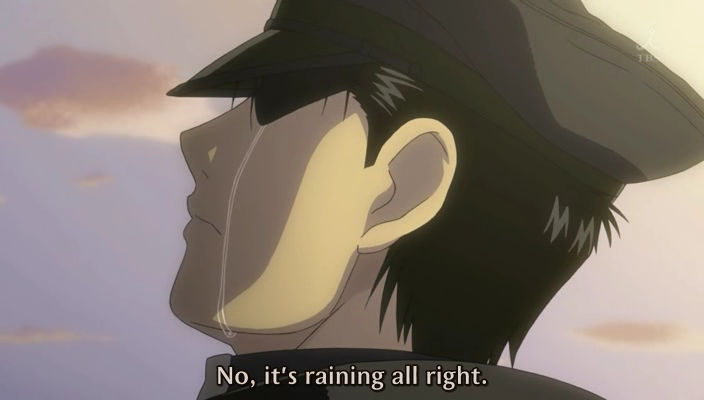 It was one of the most heart wrenching and sickening scenes that Fullmetal fans still have a hard time dealing with. Though in the end, Nina would be put out of her misery, as the state alchemist serial killer Scar put her and her father to death. Tomoya is a single father. His wife Nagisa lost her life giving birth to her daughter Ushio. Nagisa had always been a very sick person and finally her illness caught up to her. Unfortunately for Ushio, that same unknown illness plagued her life too. She'd often miss school and be bed ridden, but Tomoya would always stay by her side just as he did Nagisa. Having gone in to deep depression and missing for so long, we finally see him bounce back by making right and taking care of his daughter, which only made the following so much sadder. Ushio is adamant on going on another he trip with her father. He caves in and the two set off, though once again her health catches up to her and she pushes herself to hard. Much like how her mother passed, the snow fell and she breathed her final breath next to Tomoya's side. The saddest part is when she's in her fathers arms, she asks questions such as, "Are we on the train yet?" and, "It's dark, is it night?" It only made it sadder that he begs his wife from beyond the grave to help her daughter before the scene fades out. It's suggested that he went on to kill himself, however that was never clarified. The series would have a happy ending, but for me to explain it would give me headaches. Do you agree with my top 5? Let me know in the comment section below. Until then, make sure to check out Addicted to Anime.